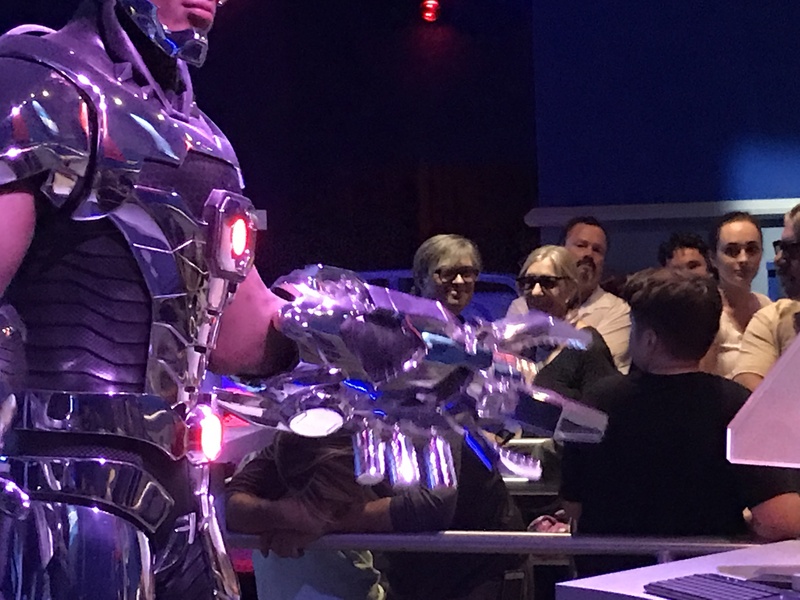 This weekend our movie industry union picked up the tab for a “family day” at Six Flags and several thousand members took advantage of the opportunity. We got to have the park to ourselves before regular park hours began, which meant that lines were practically nonexistent. The last time I posted in depth about Six Flags was to share an old map of the park from the 1980s. Things were different this time around since I’m a middle-ager. I hope that this guide will help you out a little when you decide to go back to the park. This time around my friend Dwight was my ride buddy – and buddy was he ready to ride some rollercoasters! Our first coaster was Dare Devil Dive, a compact little coaster that runs one single six passenger “airplane” at a time. We sat in the front row. Midway through the ride a kid in the second row lost his ever-loving little mind and began screaming “Oh GOD! !” over and over until we arrived back at the station. There were two airplanes loading/unloading up in front of us so he had time to calm down as we waited to disembark. Each time our car lurched forward the little boy started hollering again. He clearly didn’t understand the way things worked and his screaming became more frantic. Kid, you made my day. I rode this coaster for the first time a few years ago when I went in on season passes with some friends. I couldn’t remember if I liked it or not. There must be a science to the design of lines for rollercoasters, and the people at Six Flags must have used the very best in the industry. Even though there wasn’t a line we still had to walk through seven miles of winding paths and sewer tunnels to get to the secret Bat Lair. At one point we breezed right past a giant cattle pen of a room that could easily accommodate 15,000 or more. I shudder to imagine what that place must feel like on a 95ºF day in August. But again: no line! We were in and out in less than 15 minutes, and it was great! I ended up riding Batman twice that day and can assure you that you should sit in the FRONT ROW if you get the chance; it’s the best experience. Same short lines. We scored front row seats again. It’s a big coaster and it ranges the farthest from its station, running out across the entrance and back again. Friends who love Goliath describe the ride as “floating” and “flying”. It’s definitely a must do, but it’s not my favorite. We crossed the park to ride Superman. I’d ridden this coaster once before during the year that I had a season pass. This time around I paid more attention to the experience and was curious to see what Dwight would think. After it was all over we agreed that it wasn’t a great experience. You spend most of your time staring at dirt. It’s uncomfortable – you have to bend your neck back to look ahead. It’s officially my least favorite coaster. Since we were in the neighborhood we decided to ride the park’s most classic rollercoaster. This wooden rollercoaster was built in 1973 and it nearly killed us. Clickity Clack, Rumble Rumble. It was clunky and heavy back when I was a kid and it’s still clunky and heavy now, but I’m no longer a kid. If I had to use one word to describe the Scream Machine it would be “VICIOUS”. If I had to use five words to describe the Scream Machine they would be “DESIGNED TO CAUSE PERMANENT INJURY”. At the very end of the ride they SLAM ON THE FRICKING BRAKES FOR NO GOOD REASON, bringing you from around 35 miles per hour to zero in about 1 second. They put you in traction if this happens to you in a traffic accident! If I was in charge of the park I would rename it THE GREAT AMERICAN WHIPLASH & SPINAL INJURY EXPRESS and then I would set it on fire. If they had had this building at the park when I was 9 years old I would have stayed there all day. It looks exactly like the building from the old Super Friends cartoons from the 1970s. We had been told that the ride was broken, but there was clearly a stream of people going inside so we hurried over to give it a whirl. It was a little stuffy inside the building, but we knew that things would move along quickly as they had at the other rollercoasters. What we did not know is that there would be a video of a cartoon Joker and a cartoon Lex Luthor running on endless loop. We also did not know that they would have the volume turned all the way to 47. I love Mark Hamill’s Joker voice as much as the next nerd, but I prefer that it not vibrate my skeleton. Things were soon made much better by a young man calmly announcing “WAAAA WAAAA WAHHH BLAAAA WAAAA WA WA WAAAAA WAAAAA WAAAAA” followed up by a clarification “WAAAARRGA WAA WAAAKA WAH WAH WAH”, which made perfect sense. The noise of the young ride employee eating his microphone combined with the thundering voice of the Joker to create auditory mush. “This is actually the ride!” I shouted wittily to some friends in the line. “WHHAATT? ?” they shouted back, clearly in distress. A lady behind us apparently understood the language the young man had been speaking and began making her way back through the line to the door. “He said the ride is broken!” the lady screamed back over her shoulder. “I don’t think it takes tokens! !” Dwight screamed back at her. Man but it was loud in that place. We eventually made it into the area where the cars were located but the employees were only offloading passengers. I spotted my friends Chris and Laurie up at the head of the line, so we waited a bit longer to see if things would work out. We finally ran out of patience and decided that it was time to bail on the ride and go enjoy the free lunch arranged by the union. Clambering over and under railings we made our way back outside just in time to hear the ride operators calling out instructions to park guests. The ride had resumed operation. After lunch we walked back up the hill to try a coaster located on the site of the old Ninja, a rollercoaster that I was heavily warned against riding because it was said to slam your head around a lot. As we stood in line for the first row we listened to a voice telling us all about how cool this new ride was. The more I listened to them telling us about this “new” ride the more I began to suspect that this was just a revised version of the Ninja. The giveaway was when the voice said “…and NEW BLUE PAINT”. Several people left the ride holding their heads, talking loudly about how much fun that they’d had. 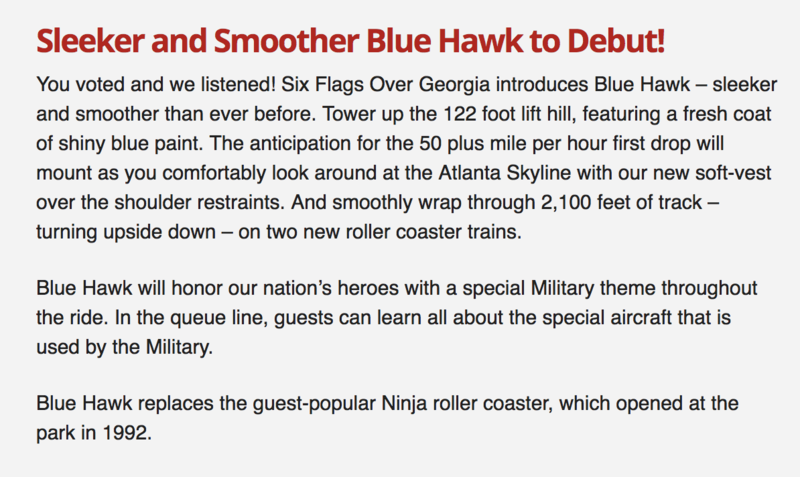 I got online to check out the stats on the coaster and it IS just a revamped version of the Ninja! They just added some better padding and painted the darned thing. If you look at their website they even mention the “fresh coat of shiny blue paint”. Very clever, Six Flags, very clever. 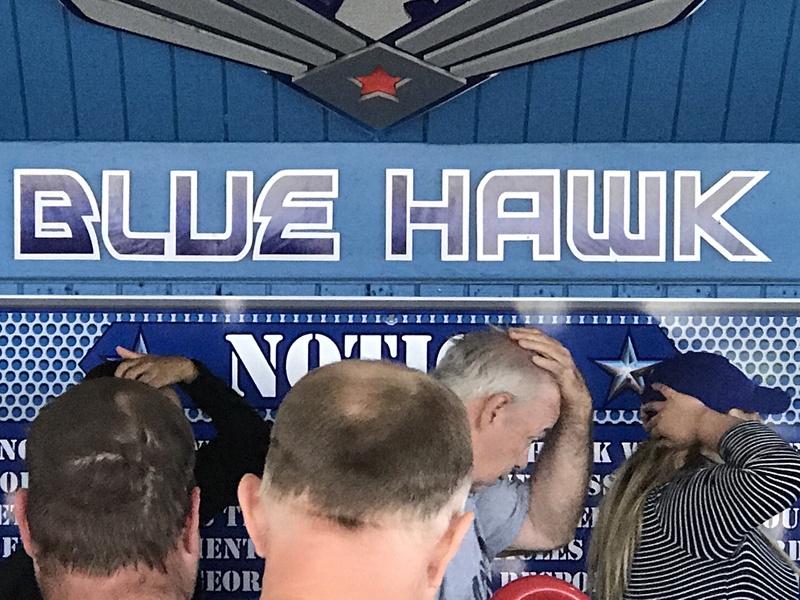 Dwight really wanted to ride the SkyScreamer next, but I remember how much some friends had hated the ride and my childhood friend Nikki specifically warned me against riding it when she found out that I was at Six Flags. But Dwight wanted to ride a swing way up in the air. I finally agreed to ride it but only after I’d had a chance to stop by a bathroom. We weren’t gone more than 10 minutes, but by the time we got back the ride was closed. Talk about dodging a bullet! Dwight had to get home to go see a play with his wife Barbara so we circled back around the park to get in one last rollercoaster. You stand up for this ride, with your body wrapped by a padded enclosure held up by a slim vertical pillar behind you. That enclosure can move up and down to accommodate people of different heights. At some point during load-in they lock the enclosures in place at the height you’re standing, so if you happen to be at full height you might find your crotch feeling a bit mashed at some point in the ride. Dwight went home and I tagged up with the office manager of the union local who was in need of a ride buddy. We started off small. This little ground-hugging antique began many people’s love affair with rollercoasters. It’s kid-sized, but fast and fun in spots. It’s also herky jerky, rough and tumble. I was too busy grunting and yelling “OOOOF!” to take offense. After it was over we circled around to pick up her family and headed off to try the Hall of Justice again. We stood in line about 10 minutes or so when the word went out that the ride was broken again. The others were slightly disappointed but I was mostly relieved because I had not been looking forward to listening to the Joker screaming at me for another half hour. I can’t be the only person who calls this the “Arachnophobia” because “Acrophobia” just won’t stay in my brain. It sort of reminds me of the old ride The Great Gasp because it’s a “dropper” – but this one is much meaner. Thanks to this ride I now know the noise I will make in my last seconds if I ever fall from a great height. This old classic is still fun but it’s rough in places, something that I didn’t remember from my youth. This was built in an era before computer modeling, so it was up to some guy named Pete to make smooth curves through three-dimensional space. I’m pretty sure that Pete was wall-eyed because there were places on that ride that slammed me around. Still, I can see why we thought this ride was so smooth back in the 1980s: our only comparison was the Scream Machine… riding in the back of a dump truck filled with rocks would have been smoother than that thing!! Lots and lots of Advil. 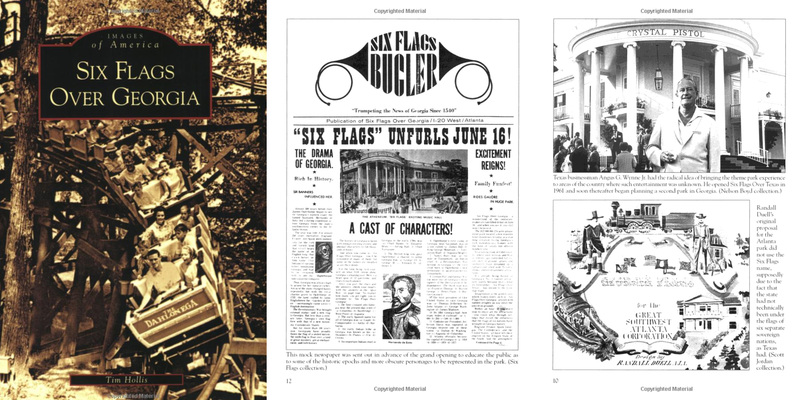 And if you’re feeling nostalgic you might consider buying yourself a copy of Six Flags Over Georgia (Images of America) by Tim Hollis. 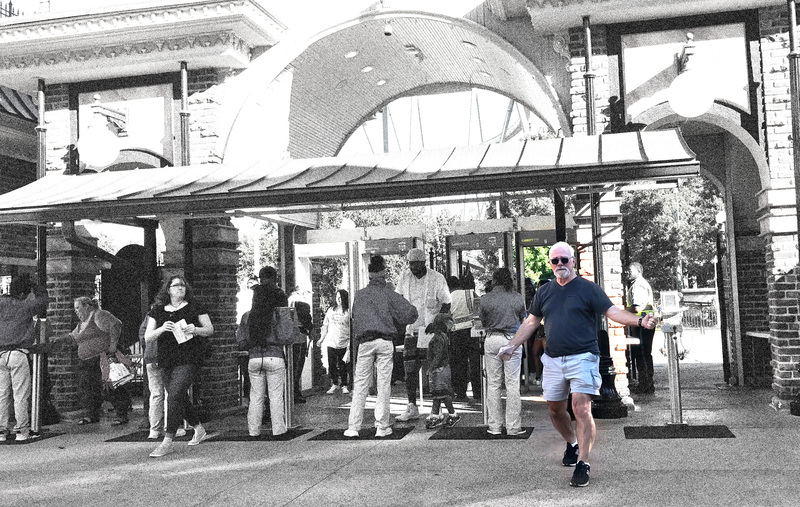 Chadwick Miller has put together an eBook called Six Flags Over Georgia at 50 – the veracity of the information presented might be questioned since it appears to be self-published, but it might have good stuff as well – let me know! A friend read this post and commented “This sounds like a day in hell!” so I wanted to drop back in and say that I actually had a great time. My friend Todd and his wife were ready to come join me for the back half of the day to do Fright Fest but I was just too worn out from all the fun I’d already had (and from walking many miles). The weather was nice and cool and the employees were pleasant. If Thunder River had been running I’d have been on it, even if it was cool. Nobody would ride the Log Flume with me, even though it was running. Everyone who did manage to catch the Hall of Justice while it was working said that they really enjoyed it. One of them said that he wished that it was an even longer ride. The fact that it’s a big video game with practical pyro effects suggests to me that it will always require constant tweaking to keep it up and running, so if you go there just stay in line and wait for it to come back online. Dwight wanted some coffee during the first part of the day but we couldn’t find any. They apparently don’t offer it anywhere on the site. As popular as coffee is you’d think they’d have a deal to sell some sort of Coca-Cola branded coffee product, but perhaps they’ve already tried it and found there just isn’t enough demand. 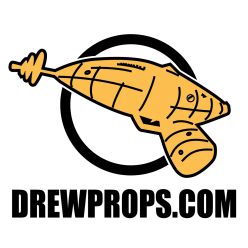 Previous Previous post: Dragon Con Turns 31 – Is It Too Big Now?